We know being a kid can be hard, but being yourself should be easy! If you’ve got questions, we’ve got answers! Here’s what many campers have asked us: Have a question we didn’t answer? Email us at info@campfriendship.com. 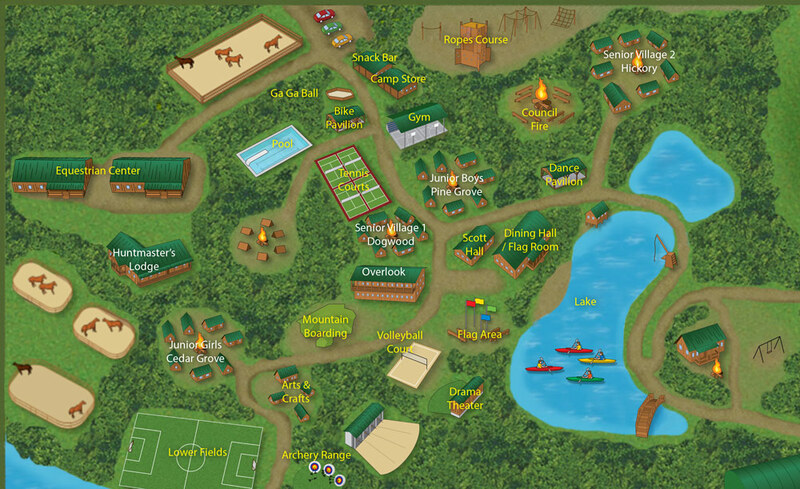 Campers in Traditional Camp have 5 activity blocks each day–3 in the morning and 2 in the afternoon. In between the morning and afternoon activities we have Free Swim in the lake or pool, cabin time to rest or write letters home, and Snack Bar/Camp Store time. 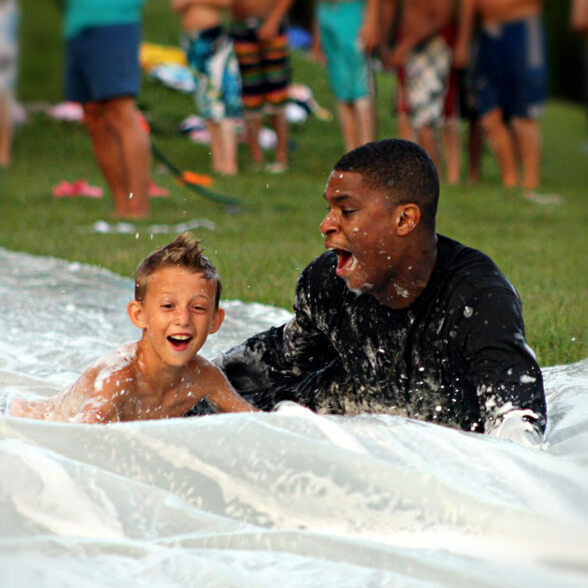 In the evenings, we have fun evening activities like slip ‘n slide, dance parties and cookouts! If you’re doing a Half Day option (drama, tennis or horseback riding), your morning will be spent focusing on that activity and you’ll have 2 activities in the afternoon. How do I pick my activities? 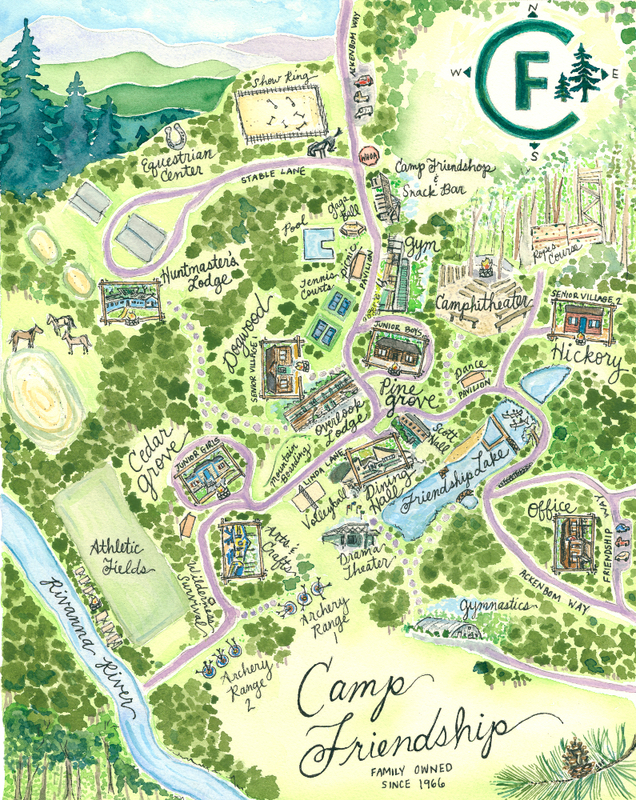 When you arrive at camp, your cabin counselors will give you a list of 35+ exciting activities to choose from. You’ll select your top 10 choices and the next morning you’ll get your own unique schedule of 5 activities that you’ll do each day for a week. Sneak a peak at all the activities available! Weekends at camp are awesome! On Saturday afternoon you have the chance to try out new activities and enjoy extra time at the pool with your new camp friends. After dinner, there’s a movie night and on Sunday morning everyone gets to sleep in! Don’t stay in bed too long though–your new friends will be arriving soon and another awesome week at camp awaits! There’s no such thing as rain at camp – only liquid sunshine! Most activities can continue in the rain or will be relocated to a covered area nearby if there’s a thunderstorm. Afternoon thunderstorms are a great time to challenge your counselors to a game of indoor GaGa ball, play a card game with cabin mates or finish that friendship bracelet you started! What if I can’t swim or don’t like swimming? No big deal! 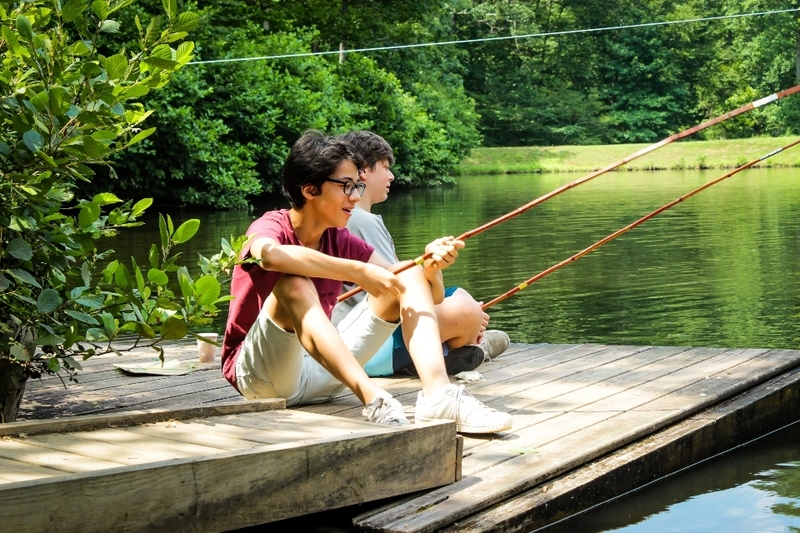 Camp Friendship has over 35 activities, so there’s plenty to do away from the water. We do have a daily free swim time at the lake or pool, but if you decide not to swim there’s always beach volleyball, card games and friendship bracelets to make! Campers who do want to swim during the week will be asked to do a quick swim check when they arrive at camp. If our lifeguards think it would be safer for you to wear a lifejacket when you swim in the lake, we’ll help you to pick one out so you can enjoy the zip line, rope swing, slide and high dive! See for yourself with our virtual tour! All our cabins have bunk beds, electricity and screened windows. Cabins are not air-conditioned and do not have ceiling fans, but feel free to bring your own fan to stay cool! 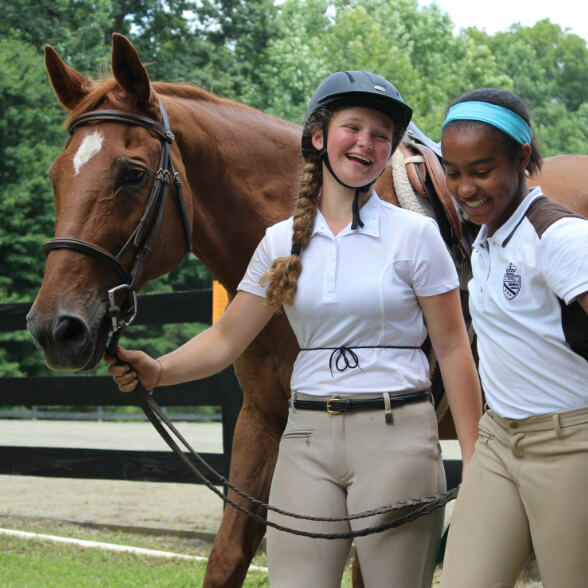 Junior Villages and Equestrian Village lodging have bathrooms inside, while Senior Village cabins have bath houses just a short distance away. Counselors are the fun-loving adults that take care of you when you’re at camp. Counselors at Camp Friendship are kind, caring and interesting people that come from all over the world. They love teaching activities and having fun with you. They’re always there to answer questions or help you with anything you need! Will I be the only new camper? No! Every summer we have first time campers of all ages, so you definitely won’t be the only camper who hasn’t been to Camp Friendship before. Making friends is what Camp Friendship is all about! You’ll have the chance to make friends with your cabin mates, but you’ll also meet so many new people in your different daily activities. Will I be the only American/International? No! Every week, we have campers from all over the United States and all over the world join us here at camp. What if I want to come to camp with a friend? Great – the more the merrier at Camp Friendship! If you’re coming to camp with a friend, you can request to share the same cabin. Friends will likely do different activities throughout the day but will be together at the beginning and end of each day and during cabin time. Camp food is great, and there are always so many options to choose from during our buffet style meals! If you don’t like scrambled eggs for breakfast, we have loads of choices including toast and cereal. If you don’t like pizza, we have pasta and more! We have a full salad bar and sandwich bar available during lunch and dinner in case you want to build your own. All food is nut free and there’s also a vegetarian, vegan and gluten free option at each meal. There’s always plenty to eat at meal times, but don’t forget to leave room for dessert! Camp days are long and busy, so we have Snack Bar time every afternoon to make sure you have enough energy to do your activities! Every morning at breakfast, you can select a drink and snack to have in the afternoon. If you’re hungry in between activities, the Dining Hall is always open for you to grab some fresh fruit or cereal before heading to your next activity. Not a problem! As long as we know about your specific allergies beforehand, our kitchen staff are always more than happy to help. Can I bring my phone/tablet/iPad/Kindle/Nintendo DS, etc? Nope! Camp Friendship is technology-free, and we love it that way. Trust us, you won’t even miss it when you’re here! Wear comfortable clothes that are okay to get messy! We’ve created a handy packing list to make sure you have everything you need when you’re at camp! Our Camp Store is a great back up if you’ve forgotten something! We sell water bottles, bug spray, toothpaste and CF-branded clothing to remember us by. If you need something to be mailed to you, just tell your counselor and they can coordinate it with the Village Supervisor. 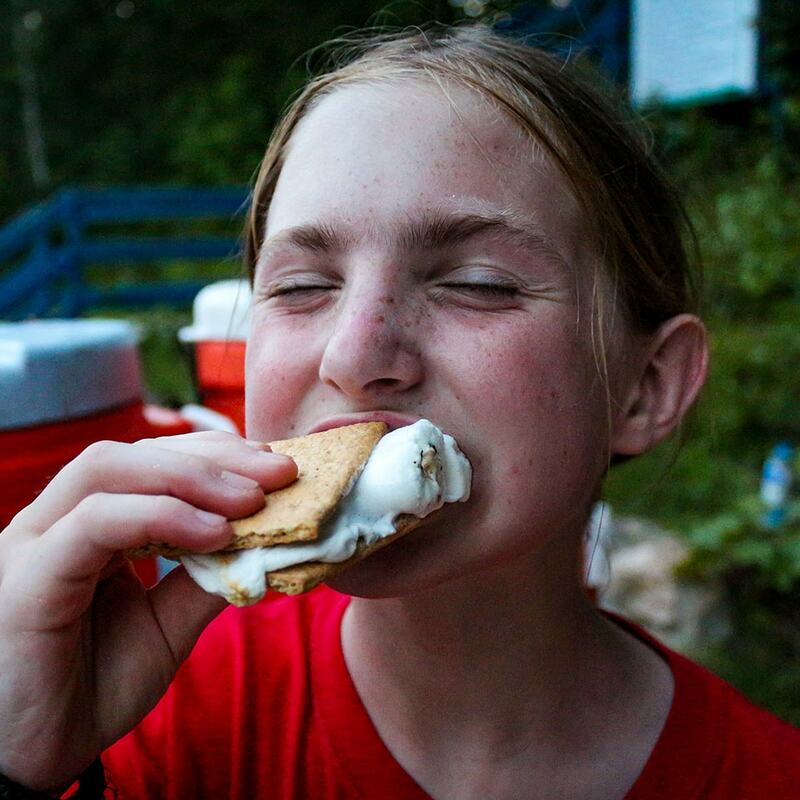 Read our blog on why it’s awesome to get a ton of fresh air and go technology free for a week at Camp! This is my favorite place on Earth!